Whether Is It a simple belly ache or Crohn’s disease with an abscess, the documentation should provide the necessary information to assign the appropriate codes. Question: Patient is a 72-year-old male admitted to the hospital after having complaints of a “belly ache.” Patient has a history of Crohn’s disease of the large intestine. On exam, patient has diffuse tenderness over the entire abdomen. CT scan of the abdomen reveals an abscess secondary to Crohn’s disease of the descending colon. Assign the appropriate diagnosis code. K50.114, Crohn’s disease of the large intestine with abscessWe need to know a little about the anatomy of the digestive system here and where the descending colon is located. If you aren’t sure, look it up. According to WebMD, the descending colon is part of the large intestine. In the ICD-10-CM coding manual, let’s look in the ICD-10-CM coding manual under Disease, Crohn’s. It tells us to see Enteritis, regional. Looking under Enteritis, regional, large intestine, with abscess, it refers us to K50.114. Verified in the tabular, K50.114 is Crohn’s disease of large intestine with abscess. ICD-10-CM, diagnosis codes for Crohn’s disease can be found in Chapter 11., Diseases of the Digestive System (K00-K95), specifically under the heading, “Noninfective enteritis and colitis” (K50-K52). According to the ICD-10-CM Official Guidelines for Coding and Reporting, code K50 (Crohn’s disease [regional enteritis]), is broken down further into specific codes based on site, and whether the disease presents with complications. Sites include small intestine, large intestine, both small and large intestine, and unspecified. Complications include rectal bleeding, obstruction, fistula, abscess, other, or unspecified. 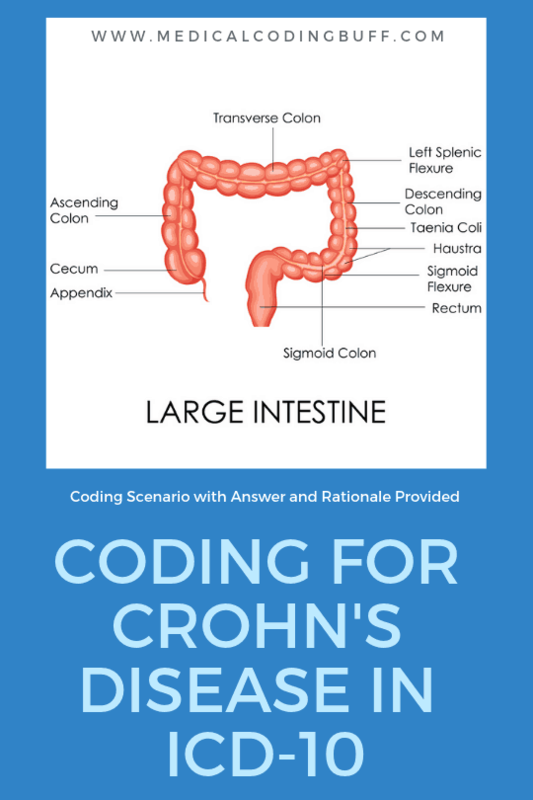 When coding for Crohn’s disease, be sure to review the documentation for pertinent details before assigning diagnosis codes. Also, follow all Includes, Excludes, and Use additional notes and apply, when applicable.